Side note, did you ask the photographer from the first photo how they got permission? Might help with the whole playing cards thing? I think that P90 in the photo is probably illegal under the Violent Crime Reduction Act as a realistic imitation firearm. The way the nanny state is going, I'm sure it won't be long before breaking wind in public is considered to be a firearms offence. Or maybe a thought crime, those seem popular these days. That said, in my case it's probably more like an international war crime (Weapon of Mass Destruction) owing to the sheer volume of omelette I've been consuming lately. �� (The artist formerly known as Mr Cockburn). 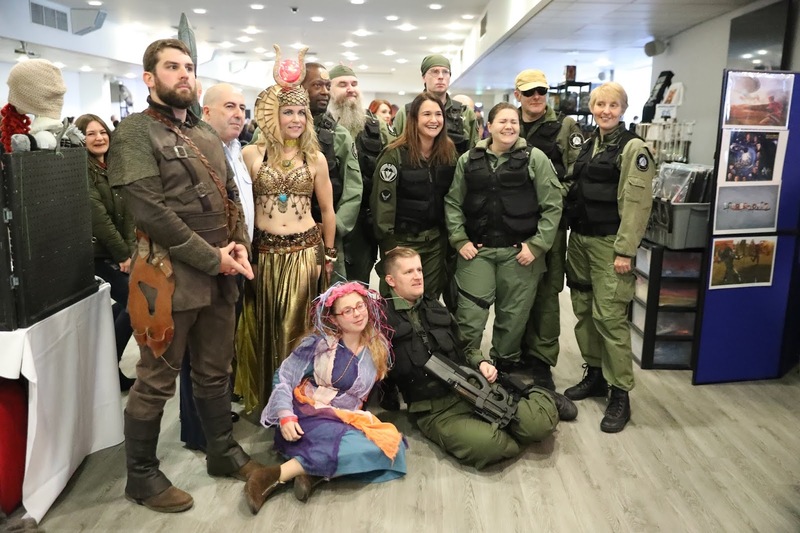 It probably is but just as with the knife laws, the police are supposed to use discretion and know the difference between a cosplayer and a potential terrorist. Sorry, you're right, it's section 19 of The Firearms Act 1968 that would apply. The internet tells me this event was at Leicester City Football Club, which seems like a public place to me. In any case, the user must have transported it there somehow which will have involved having it in a public place! I'm no expert, but it was a ticket holder only event, but as you say, that may count as a public place. 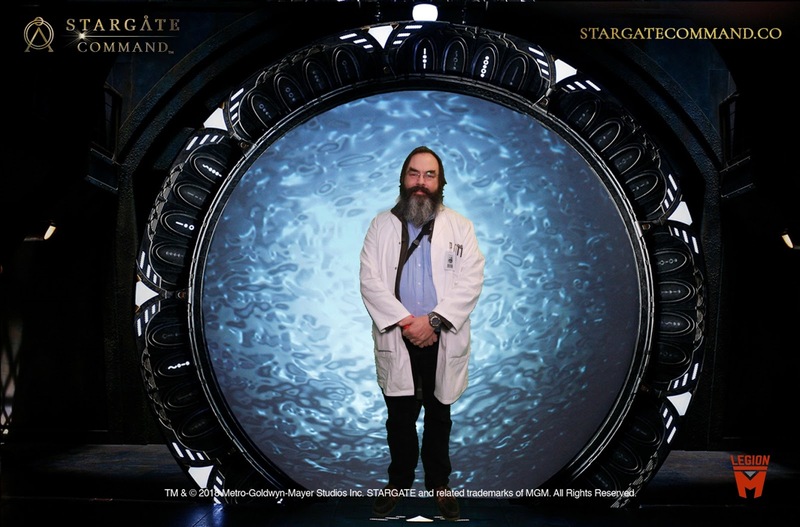 The issue may be whether "Stargate convention in costumer" (or travelling to one) is a "reasonable excuse", I guess. Yeah, probably not something I'd like to risk having to deal with an armed police response to when someone calls the police about the "guy in military fatigues carrying an assault rifle", but it does perhaps seem a "reasonable excuse". In any case, it's certainly illegal to buy/sell or import such a weapon since the VCR act. My motto is Never be a ��. Always play it safe. Safety first always. �� (pronounced as "The artist formerly known as Mr Cockburn"). Don't imitation weapons have to have bright orange nozzles these days so that you know it's not real? Part of that legislation (see above), and I think more than just he nozzle. I don't believe the VCR Act would necessarily be an issue for a manufacturer of imitation firearms for "theatrical performances and rehearsals of such performances" or those who produce airsoft guns there is a defence there. As for S19, I'd suggest that if the event is open to the public (even if they need a ticket or have to pay) then you'd be in a public place. However I'd suggest that you may have a reasonable excuse. The test of how reasonable something is is based on common sense - if you walked through a shopping centre like that, you'd almost certainly commit the offence or indeed the more serious S16A offence. However if you are at a closed fan event where the context is likely to be understood by all, then you'll likely to have a reasonable excuse. As for getting to the event, transporting the firearm in a suitable case when getting from A-B, you'd again likely have a reasonable excuse. I'll have a read of my law book next week to see what the case law says! Thanks, Anonymous. I'd be very interested to know the legal position here. Oftentimes I feel the nanny state goes too far against common sense and limits our personal freedoms. Obviously those freedoms need to be balanced against not scaring other people unintentionally and suchlike, but sometimes people do take jobsworthiness too far in my opinion. Only the other day I was told off by someone for taking a photo of my street!! He didn't know me and it was just a nice sunset. There I was, standing on the pavement with my camera taking a nice photo of the street and minding my own business. But because I had a big camera (not ridiculously huge, just a good quality SLR with a lens) he felt the need to ask me if I had a licence and got all jobsworthy about it! Had I been taking the same photo with my phone I doubt he would have cared. And besides, it was bleedin' obvious I was just taking a photo of some nice scenery, no weirdness at all going on. Aren't people odd sometimes. He wasn't an official person by the way, just a random passer-by. Cosplay involving relica/model firearms (RIF or otherwise) is /usually/ going to be a "reasonable excuse", but as with everything which is worded vaguely, it's at your own risk to determine where the police/CPS draw the line, and if you fall the other side of that line, how it would go down in court. You should watch in order. Start alternating episodes of Sg1 and Atlantis until S10 sg1. When s10 started airing, Atlantis Ep were new first so you watch Atlantis S3 E1, then SG1 S10 E1, until end of sg1. Ark of truth, then Season 4 Atlantis. Wow, thank you very much!! I wasn't expecting such an excellent answer, but now I know exactly how to go about it. 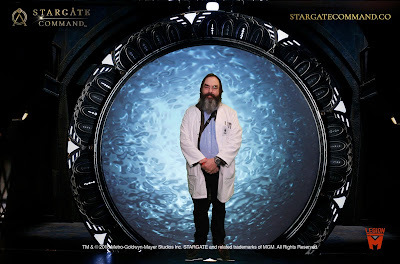 I'll be starting my stargate adventure this evening with the Movie, I think!! I love star trek so much (especially STTNG) and got sad when DS9 came along because I thought there was nothing left to watch, then voyager come along but I have almost finished that too. Can't wait to start watching Stargate!! As always you have to pretend science and mathematics are not real and just go with the flow. But it is fun. Oh, and don't expect the series to be as bad as the film, and the actors change between the two! It definitely improved year on year. They really found their feet by the end, although by the time the Ori storyline had started it was starting to feel a bit tired. It's still one of my all-time favourite TV series. They suffered from running too long.. each defeated bad guy had to be more powerful than the last, until it got to the point that they were defeating things with bona-fide godlike powers and it was getting a bit silly. I'm currently watching the end of Star Trek Voyager series 2 and it has all those god-like aliens again (the ones like Q and The Caretaker) which are brilliant. I love all the exotic super-powerful alien stuff! I wonder if such exotic extra-dimensional beings of unknown origin who possesses immeasurable power over normal human notions of time, space, the laws of physics, and reality itself, being capable of violating or altering them in unpredictable ways with a casual thought or gesture, really do exist elsewhere in the universe. What an experience it would be to ever meet one!